Speak with RDP Corporation 937.246.1245 | Serving Ohio, Michigan, Indiana, Kentucky, western Pennsylvania and West Virginia. 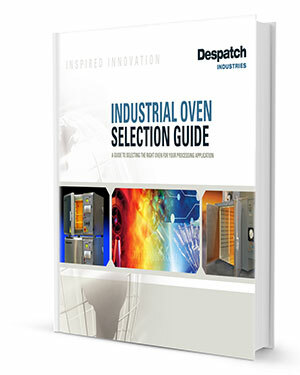 This guide will give you an in-depth look into selecting the right oven for your process. We take you through 10 selection criteria from airflow, defining your application, temperature controls to deciding on standard or custom solutions. When contacting you via e-mail Despatch Industries will always give you the option of opting out of future messages. You are deemed to agree and bound by the following terms and conditions by accessing and using the Despatch Industries web site. Do not access these pages if you do not agree and are not bound to the following terms and conditions. The content of this site, including but not limited to, the text and images herein and their arrangement (collectively the “Pages”) are © Copyright 2012 Despatch Industries. All rights reserved. The information published in these Pages is provided without charge as a convenience to visitors, to be used for informational purposes only. While Despatch Industries has tried to provide accurate and timely information, there may be inadvertent technical or factual inaccuracies and typographical errors. Despatch Industries reserves the exclusive right to add, delete, or modify any information in the Pages or withdraw the access to the Pages at any time, without notice. Despatch Industries disclaims any duty to update any information that the Pages contain. The contents of the Pages are fully owned by Despatch Industries. The Pages are provided “as is.” No warranty or indemnity of any kind, implied or statutory, including but not limited to, the warranties of non-infringement of third party rights, merchantability, and fitness for particular purpose, is given in connection with such contents. Despatch Industries makes no representation or warranty as to the completeness, accuracy, or reliability of the information contained in these Pages. Despatch Industries shall not under any circumstances be liable for any direct, indirect, consequential, incidental, secondary, or special damages or lost profits whether resulting from the use or inability to use the Pages, even if Despatch Industries has been advised of the possibility of such damages. Despatch Industries does not give any representation or warranty of any kind, either express or implied, that the Pages (including third parties’ pages to which the Pages have a link) or the server that makes the Pages available, are free of harmful components such as viruses. Reproduction, storage, transfer or distribution of the contents of the Pages, entirely or partially, in any form without prior, written consent of Despatch Industries is strictly prohibited. You may, however, store on your computer and print copies from the Pages solely for your personal, non-commercial use, subject to the terms of this Legal Notice. Modification or altering of any kind of the Pages or use for any other purpose is strictly prohibited. All rights not expressly granted to you remain in Despatch Industries. The site may be linked to other sites that are not maintained by Despatch Industries. Despatch Industries is not responsible for the contents of those sites. The inclusion of any link to such sites does not imply endorsement, sponsorship, or recommendation by Despatch Industries of the sites, their contents, or their sponsors. As visitors accessing the information on these Pages on a service in the United States of America, the Pages (and any information contained therein) are to be provided in the United States of America and subject to United States of America law without regard to Country conflicts of laws principles. ALTHOUGH EVERY REASONABLE EFFORT HAS BEEN MADE TO ESTABLISH THE ACCURACY OF THE INFORMATION CONTAINED ON THIS SITE, DESPATCH INDUSTRIES DOES NOT GUARANTEE ACCURACY. DESPATCH INDUSTRIES SHALL HAVE NO RESPONSIBILITY OR LIABILITY TO ANY PERSON ACCESSING THIS SITE OR OTHER THIRD PARTIES FOR USE OF OR RELIANCE ON THE INFORMATION (INCLUDING BUT NOT LIMITED TO THE FORMULAE) CONTAINED ON THIS SITE. DETERMINATION OF APPROPRIATE EQUIPMENT FOR PARTICULAR APPLICATIONS SHOULD ONLY BE MADE BY PROFESSIONALS. USE OF IMPROPER EQUIPMENT COULD RESULT IN SERIOUS INJURY TO PERSONS OR PROPERTY. NO WARRANTY, REPRESENTATION OR CONDITION, EXPRESS OR IMPLIED, IS MADE WITH RESPECT TO THE INFORMATION CONTAINED ON THIS SITE AND ALL OF THE SAME (INCLUDING BUT NOT LIMITED TO THE IMPLIED WARRANTIES OF MERCHANTABILITY AND FITNESS FOR A PARTICULAR PURPOSE) ARE SPECIFICALLY AND EXPRESSLY DISCLAIMED. THE INFORMATION ON THESE PAGES IS NOT A WARRANTY NOR A REPRESENTATION WHICH MAY BE RELIED UPON FOR THE ESTABLISHMENT OF ANY OBLIGATION, LIABILITY, RIGHT, CLAIM, OR REMEDY IN CONTRACT OR IN TORT, INCLUDING PRODUCT LIABILITY BASED UPON STRICT LIABILITY, NEGLIGENCE, OR IMPLIED WARRANTY IN LAW. ONLY THE WRITTEN WARRANTY DOCUMENT, IF ANY, INCLUDING THE DISCLAIMERS AND LIMITATIONS THEREIN, WHICH MAY ACCOMPANY THE SALE OF ANY DESPATCH INDUSTRIES PRODUCTS APPLIES TO SUCH SALE, WHETHER THE ORDER FOR SUCH SALE IS COMPLETED ELECTRONICALLY OR IN WRITING. NO ELECTRONIC COMMUNICATIONS THROUGH THIS SITE MAY CREATE A WARRANTY OR CONTRACTUAL AGREEMENT OF SALE OR PURCHASE. Despatch’s search is simple, just type whatever comes to mind in the search box, hit Enter or click the Search button, and Google will search the site for content relevant to your search. Most of the time, you’ll find exactly what you’re looking for with just a basic query (the word or phrase you search for). However, the following tips can help you make the most of your search. Phrase/Exact Search (““) by putting double quotes around a word (or set of words), you are telling Google to consider the exact words in that exact order without any change. Terms You Want to Exclude (-) attaching a minus sign immediately before a word indicates that you do not want pages that contain this word to appear in your results. The OR Operator Google’s default behavior is to consider all the words in a search. If you want to specifically allow either one of several words, you can use the OR operator (note that you have to type ‘OR’ in ALL CAPS).